Sphynx cat breed information and advice. The Sphynx is a popular cat and unusual in looks. 'The Sphynx is possibly one of the most affectionate, sociable and intelligent cats in the world,' shouts the Sphynx Cat Club's website. That's quite a claim but one that seems to be echoed by anyone who gives a home to these soft downcovered cats. Yes, that's right, despite appearances they're not completely naked and their skin has the texture of a peach - Sphynx should not be described as bald! They're warm to the touch too! It really is difficult to judge or appreciate Sphynx just from photographs. What wins people over, beyond the appeal of the unusual, is their larger-than-life characters. They adore human attention and enjoy cuddles and games. Sphynx are very affectionate cats with big personalities, and they are playful well into adulthood. They've even been described as 'part monkey, part dog, part child, part cat'. Those who own and breed Sphynx can't praise them highly enough. They are totally in love with the cats' looks and personality. Jass Nice is vice chair of the Sphynx Cat Club and breeds and shows Sphynx. She says she particularly likes their interactive nature. "Whether with humans or other pets, it never enters their heads that a visitor has come to see anyone but them! I love their child-like innocent nature. I love their little paws that they stretch up like fingers." A Sphynx is not the ideal pet if you are out at work all day. They love human companionship and mix well with other cats and dogs. Sonya Hornsby of the Sphynx Cat Association says: "The Sphynx is a high maintenance breed; they are demanding and do need/want a lot of attention. A Sphynx will want to be with his or her owner every minute of the day if they can. They are also a vocal breed - happy to let their owner know if they are hungry or want attention. Some people do find them too much though, and this is where researching the breed before buying is a must." Owners are advised to keep them as indoor pets, ideally with access to the outdoors in an enclosed run. The most distinctive feature of the Sphynx is his lack of fur. The Sphynx is of medium-size boning and body conformation, with surprising weight for his size. The head shape is a modified wedge, with prominent cheekbones and whisker pads. The body is warm and soft to the touch. Despite being hairless, Sphynx have a range of different colours. There are black and whites, red and whites, torties, whites, blues, and lilacs. "Price should be the same regardless of colour or eye colour," Sonya says, warning: "We have had cases of breeders selling 'rare black torties' for huge amounts of money when they are not rare at all." The Sphynx first appeared as a natural mutation in Canada in 1966. 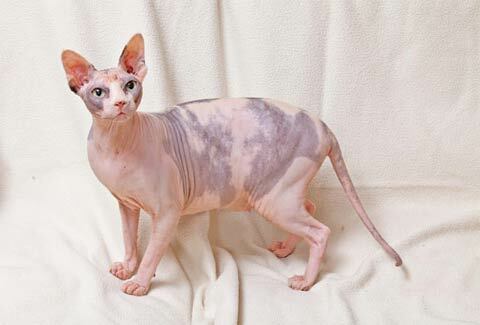 The first hairless male, Prune, was mated back to his mother, and some of their hairless kittens were exported to Europe, where they acquired the breed's name. They arrived in the UK in the 1980s, and more kittens are registered with the Governing Council of the Cat Fancy (GCCF) each year. Breeders outcross to maintain health and GCCF guidelines allow the use of two approved breeds - the Russian Blue cat breed and the domestic shorthair. Are Sphynx cats suitable for allergy sufferers? Some people who have found themselves to be allergic to 'normal' cats have successfully shared their home with a Sphynx. However, the breed cannot be described as 'hypo-allergenic' since it is skin dander that most people react to, and Sphynx do still shed dead skin - in just the same way that humans do. Sphynx kittens are said to settle with their new families remarkably quickly due to the breed's laid-back nature. It's a good idea to talk to breeders and spend time with the cats before deciding to buy. Ask to see the mother and siblings, and look for health and vigour in the kittens. They should have been reared within the home and be well socialised. It is advisable to talk to the breeder about the heart condition Hypertrophic cardiomyopathy (HCM) and ask to see copies of scan results for the parents. Sonya adds: "If a breeder neuters early (which we recommend) then expect the kitten not to leave home until he or she is 16 to 17 weeks of age." Expect to pay around £700 to £800 for a kitten and be prepared to wait as there are still relatively few breeders in the UK. The Your Kitten section, from page 78, is a great starting point if you're looking for a breeder. Occasionally adult Sphynx become homeless for a variety of reasons and both clubs will seek loving and understanding new owners for them. Instead of a brush, Sphynx require a flannel. Grooming means a wipe with a damp cloth occasionally, but particularly if it's hot and they've become sweaty. A bath from time to time with a gentle shampoo may also be needed. Their very large ears, lacking in hair to act as a filter for dust and dirt, need to be cleaned regularly to avoid wax build-up. It's also a good idea to regularly clip their claws. A high quality diet is important for the Sphynx. Sonya says: "I am also welfare officer for the Sphynx Cat Association and we do see a lot of cats with stomach problems, sometimes due to inappropriate diet. Some Sphynx can have sensitive tums so a good quality food is a must. Many Sphynx owners feed a natural raw diet or at least a high protein grain-free diet." Sphynx like warmth and to be out in the sun, but owners need to be careful that their cats don't get sunburnt. They also like their creature comforts: "They will happily snuggle under the duvet with their head on the pillow!" says Sonya.